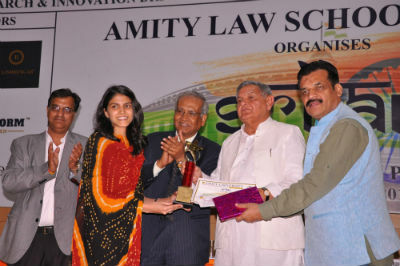 Noida: Budding legal professionals deliberate upon the vital issues afflicting the Nation during a two day academic stimulation of Indian Parliamentary System “Srijan: A genesis of Indian Politics” organized by Amity Law School Noida at University Campus, Sector-125, Noida. Addressing the gathering during the valediction ceremony, Mr. Rajesh Ranjan, Leader, Jan Adhikar Party called upon the gathering to address the issue of gender inequality. He pointed that the attitude of the society has been negative and discriminating towards women and stressed there is a need to formulate stringent laws to protect the women’s right. He apprised that he has started to loose faith in democracy of the country since, after 70 years of independence, political parties still manipulate the sentiments of people for votes on meager issues like religion, cow protection, providing staple foods, providing cycles, laptops etc rather than focusing on real issues of development. Mr Ranjan urged the students not to take any decision based on emotions and opined that positive change in society will be possible through collaborative efforts. Sharing his views, Mr. Yogananda Shastri, Ex-Speaker, Delhi Vidhan Sabha said that India has one of the finest Constitution in the world which was constituted with a proactive thought to protect every right of each citizen without discerning on gender, caste, religion etc. He called upon the budding legal professionals to guard the supremacy of Constitution for protection of rights and justice in the country. Mr. Prem Bhardwaj, Former State President of Delhi in Indian National Congress, Sevadal (AICC) said that it is necessary for government to spread awareness about the fundamental rights of the people. He stressed that it is the responsibility of every individual and most importantly the Parliamentarians, to protect law. Mr. Bharadwaj averred that participation in debates to present one’s views at any platform is acceptable but ensure that the outcome is positive. Speaking on the occasion, Prof. (Dr.) D.K. Bandyopadhyay, Chairman Amity Law Schools said that during the two day deliberations, various National issues were discussed. The students were familiarized with current socio-political issues and understood the role of governing bodies in defining the resolutions. He highlighted that Srijan aimed to provide an enriching platform to budding lawyers which will help them in their careers ahead.